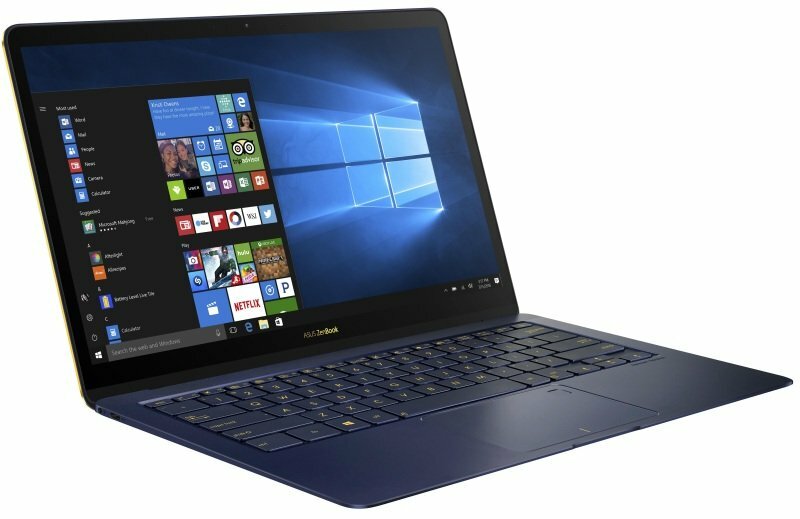 ASUS ZenBook 3 Deluxe UX490UASorry, this product is currently out of stock. A 13" formfactor laptop but with 14" thin-bezel display. 2X Thunderbolt 3 ports and 7th Gen Intel Core i7 CPU. Who says you can't improve on perfection? People say it can't be done. We think, with the new ZenBook 3 Deluxe, we've done just that. We took the outstanding ZenBook 3 and have made it even better. Featuring a beautiful 14" display contained within a compact and elegant chassis - no bigger than many standard 13" laptops on the market - it's an inimitable combination of power and beauty. The perfect balance between portability and productivity. The ZenBook 3 Deluxe measures a thin 12.9mm and weighs a mere 1.1kg, making it the very essence of portable. The ZenBook 3 as all you need for outstanding on-the-go performance. Including, a 7th Generation Intel® Core™ i7 processor, up to 512GB SSD, two USB Type-C™ (USB-C) ports with Thunderbolt™ 3 for dual 4K UHD display supports, and power-packed quad-speakers. This is the very simple design philosophy encompassing the ZenBook 3 Deluxe. It's a monument to ultimate craftsmanship, with a beauty that reflects the painstaking attention of our engineers. The beautiful lines of the all-aluminium chassis are carved from a single block of metal. This billet aluminium block goes through a 40-step process to create the iconic ultra-fine spun-metal finish with its incandescent, silken lustre. A complex 2-phase anodising process creates the elegant, golden, diamond-cut edges and unique golden ASUS lid logo. The result is a magnificent, elegant design that offers the perfect combination of beauty, flexibility, performance and productivity. The chassis of ZenBook 3 Deluxe is the size of many 13" laptops - yet it features a full HD (1920x1080px) 14" display. ZenBook 3 Deluxe is constructed from premium, aerospace-grade aluminium alloy. This type of alloy is 50% stronger than standard alloy, allowing the ZenBook 3 Deluxe to have an amazingly thin 12.9mm profile and weigh only 1.1kg. ASUS ZenBook 3 Deluxe features 0.55mm thick Corning® Gorilla® Glass 5, which is the toughest cover glass yet while delivering the damage resistance Gorilla Glass is known for. Fitting a 14" Full HD display into a 13" frame was no easy task. A key development in this area was NanoEdge, the ultra-narrow display bezel, which at just 7.46mm allows the biggest possible screen area. The result of this means ZenBook 3 Deluxe enjoys a class-leading 84% screen-to-body ratio. Wide-viewing-angle technology ensures undistorted colour and great contrast at viewing angles up to 178°, for easy collaboration and screen sharing. The glorious display, with its accurate colour reproduction and sharp detail, cannot truly be appreciated in photos. Seeing is believing. For the best visual experience, ZenBook 3 Deluxe harnesses powerful ASUS display technologies exclusive to the ZenBook. Hardware and software are optimised and combined to deliver the best possible imagery. The screen is capable of 100% sRGB, with a wide colour gamut and TV-grade 1000:1 contrast ratio. Thus ensuring greater lucidity and more life-like colours. ASUS Splendid technology applies granular control of your display to guarantee excellent colour accuracy while also providing automatic optimisation for all kinds of image. As ASUS Splendid does for static images ASUS Tru2life Video is a remarkable real-time video enhancement technology that optimises the appearance of every pixel in every video frame, delivering a 200% contrast improvement and pin-point sharpness. ZenBook 3 Deluxe uses best-in-class components to deliver unprecedented performance, built using only carefully selected parts. These include the latest 7th Generation Intel® Core™ i7 processor; up to 16GB of rapid 2133MHz, power-saving LPDDR3 memory; up to a 512GB SSD; and the latest Thunderbolt™ 3-enabled USB-C™ ports for up to 40 Gbps data transfers, dual 4K UHD external displays or external graphics dock support. There really is absolutely no need to be concerned what you can or can't do with ZenBook 3 Deluxe - you'll have enough power for all your needs!